A True Story. Based on Actual Lies. This hilarious, irreverent, and profoundly honest memoir explores our cultural obsession with social media and dares to ask: Who is the real you, and what is the story you tell others? At age 26 Dave Cicirelli found himself at a crossroads. While his friends on Facebook appeared to have lives of nonstop accomplishments, his early adulthood felt disappointingly routine. So one October morning, Dave announced on Facebook that he was dropping everything and heading west. Many thought him brave - or crazy. No one guessed he was lying. "Fake Dave" set off on a wild adventure, toilet papering an Amish horse and buggy, freight hopping with a farmer's daughter, and being kidnapped by a religious cult. But the online prank quickly became a social experiment. People began connecting over his journey, and some were inspired to change their own lives. But as Fake Dave's popularity grew, the real Dave became increasingly isolated, struggling with the implications of his secret. 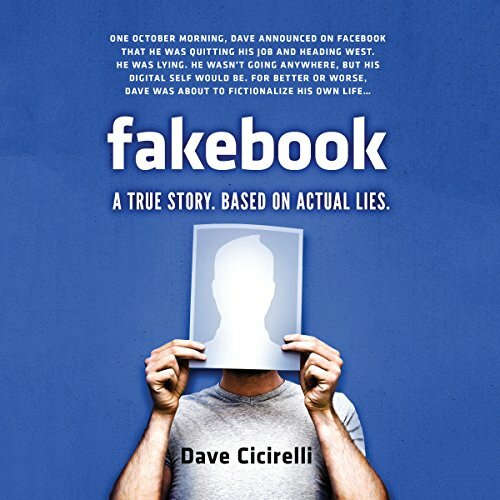 Clever, funny, and surprisingly candid, Fakebook is a true memoir of our digital age. It explores what the old ideas of reputation and relationships mean in our new world of constant connection and ultimately asks: How do you draw the line between your virtual self and who you really are? And can you discover yourself on a journey that never took place? ©2013 Dave Cicirelli (P)2014 Audible Inc.